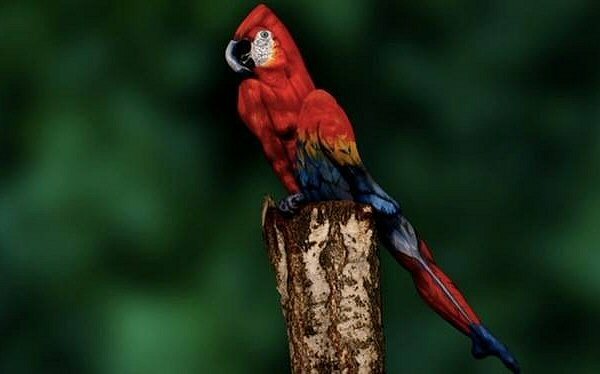 This is not a parrot, but actually a woman sitting on a log. Can you see her? P.S. — This image is on the Heaven Now Facebook page, a project of the Teitelbaum Family Foundation, which is being spearheaded by my wife Laurie. With the speed of change accelerating, my wife Laurie and I believe that anything is possible, and if we can conceive of it, we can create it! So why not begin by imagining the most fun and exciting things we can. To help with this, we are conducting a video contest with over $6,000 in prizes. Win by creating images and visions that leave you and others thinking "I Want That!!!" In addition to videos, submit your pictures which do the same to win a monthly $100 prize (coming soon). Please visit Heaven-Now.org for more information. Also please visit, Like and Share Laurie's Heaven Now Facebook page.